Hey Everyone, its Trish here today sharing a project with you all! This card was created for MFT Camp Create Day #5 which was all about shadow stamping. This card features my new favorite stamp set from MFT "Make a Wish" and a ton of Lawn Fawn Ink. I like to call this type of card a One Hit Wonder Card; in that you only need 1 stamp set to create the whole card. I love challenging myself to create cards using only one stamp set, it makes me stretch my stamps little further. 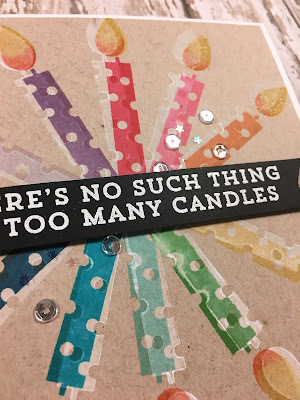 I'm starting out with a 5.5"x5.5" base to create a card big enough to fit all of the candle on my card and my kraft card stock measures 5.25" x 5.25". Before stamping the candles, I marked with a pencil the half way points on each side of my craft card stock so that my candles would be spaced out evenly. Using my Tim Holtz Scissors, I performed some stamp surgery and separated one of the candles from its group. 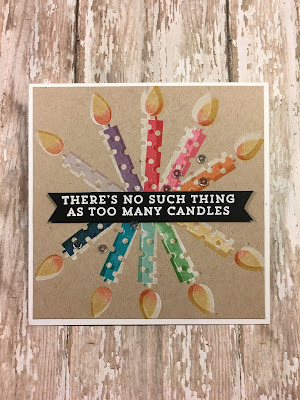 I then began stamping my candles in Lawn Fawn Yeti Ink, first starting at the top and bottom and stamping in a fan of stamps at the top and bottom of my card stock. Then doing the same with the flame for the candles. 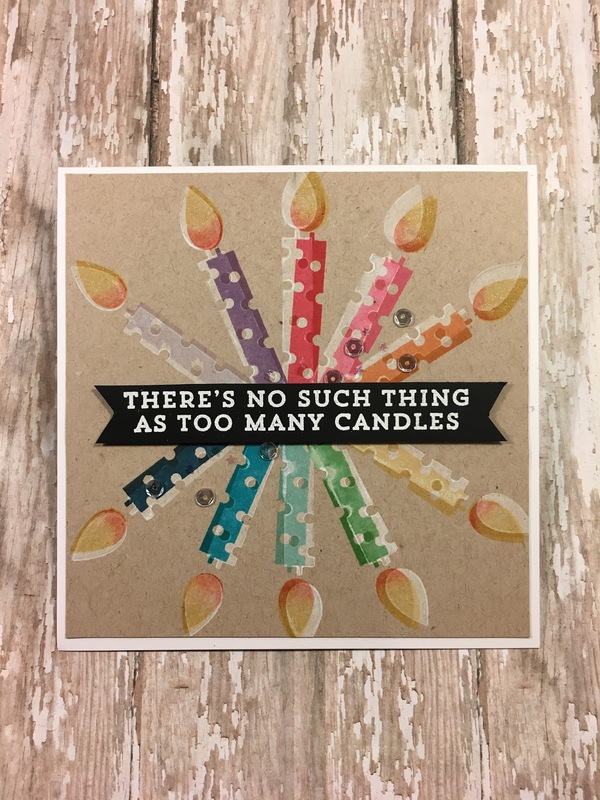 Once I had finish stamping all of the images in Yeti ink, I went in and started to stamp the colors over the candles but slightly offset. You'll see when I was trying to line them up, I was pretty off on most of the candles. The candle that came out the best looking was the light purple but we're always learning something, right? haha. Rainbow order was the color scheme I decided for my candles and all of the inks are from Lawn Fawn. In Rainbow Order: Lobster, Plastic Flamingo, Fake Tan, Sunflower, Jalapeño, Merman, Fish Tank, Deep Sea, Fresh Lavender, and Sugarplum. And for the flames, I'm stamping first in Sunflower and then just rocking the bottom of the flame in Pumpkin Spice to add a little dimension to the flame. Once I finished with the candles, I worked on the sentiment. I decided that I wanted it to really stand out from the colorful background, so I went with some Ranger Super Fine Detailed White Embossing Powder on black card stock and attached it with some foam adhesive. The last thing that I did to my card was applied some Diamonds are a Girls Best Friend Sequins with some Ranger Multi Medium Matte adhesive and brushed some Spectrum Noir Sparkle Pen in Clear on the flame. And that completes my card! I really hope that you guys enjoyed this card and that it gave you another view on this technique. Maybe you'll try it out!